What is FT8 and how do we use it ? WSJTX is now in a new version 2.0 and is no longer compatible with previous versions. If you are having trouble decoding signals it may be that you don’t have the latest version. Update and it’s like magic, back to copying people and working them again. 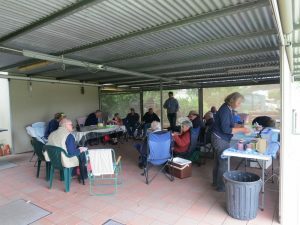 This year our Club end of year BBQ was held at the home of Greg, (VK5ZGY), and Gabi at Worrolong. This proved to be a very lucky move as the weather was cold, wet and windy and their back patio provided shelter from both the wind and the rain. Attendance was possibly down a little on last years event but the quality of those attending was excellent. 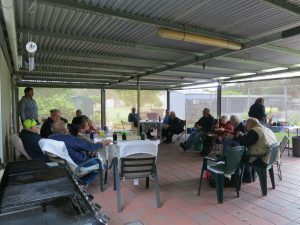 President Peter, VK5BE, formally thanked Greg and Gabi for allowing us to hold the BBQ at their home and he also thanked those present for coming along. He then wished everyone all the very best for Christmas and the New Year. Much chatter was evident and some lucky members got a tour of Greg and Gabis very environmentally conscious garden and all the electronic and bio friendly wizardry that is associated with it. There was also a bit of “Show and Tell” with Chris, VK5MC, parading his recently acquired Elad S.D.R. radio and Tom, VK5EE showed off his Solar Panel. All present had an enjoyable afternoon.